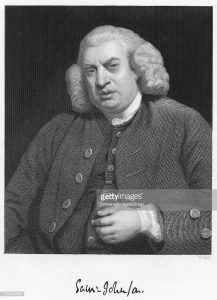 In looking up something else, this morning, I came upon a quotation from Dr. Samuel Johnson. Dr. Johnson was one of the leading literary luminaries of 18th century London. He was an extraordinary conversationalist and wit whose life is immortalized in James Boswell's biography of him. The quote I found led me to hunt for more. What I found among the many I read were nuggets of advice, I believe, for President Trump. See if you agree. "Getting money is not all a man's business: to cultivate kindness is a valuable part of the business of life." "You can never be wise unless you love reading. "Prejudice, not being founded on reason, cannot be removed by argument." "Wickedness is always easier than virtue; for it takes the short cut to everything." "Better to save a citizen than to kill an enemy." "I look upon it that a man who does not mind his stomach would hardly mind anything else." "Self-love is often rather arrogant than blind; it does not hide our faults from ourselves, but persuades us that they escape the notice of others." "To instigate the populace with rage beyond provocation is to suspend public happiness, if not destroy it. He is no lover of his country that unnecessarily disturbs its peace. "Pride is undoubtedly the original of anger; but pride, like every other passion, if it once breaks loose from reason, counteracts its own purpose. "One who desires to serve as the orangutan's chief of staff should commit oneself. Preferably to Bethlem."